Lysodren is a treatment option for dogs that have been diagnosed with canine Cushing's disease. This medication has two phases: a "loading" phase and a "maintenance" phase. The combination of the medication's two phases allows for better care of your dog's disease so he or she can be feeling like normal in no time. 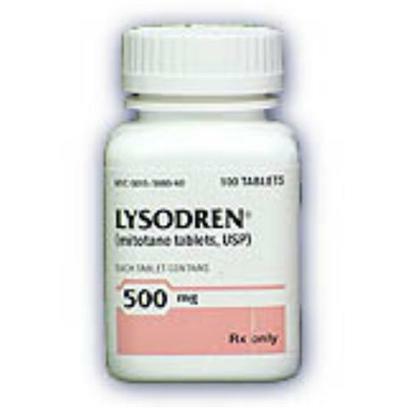 Lysodren is a perfect treatment option as it is kind your wallet. In addition, Lysodren is incredibly easy to administer to your dog. This treatment option is not a shot or a pill that you have to force your dog to swallow by hiding it in its food. There is no need to tempt your dog to take its medication in numerous unhealthy treats as this medication comes in a convenient chewable tablet. Lysodren is the Generic Alternative to Mitotane. In treating Cushing's Disease, lysodren may erode the adrenal cortex so far as to create a cortisone defiency, either temporarily or irreparably. The latter case is referred to as Addison’s disease. Symptoms include loss of appetite, vomiting, diarrhea , weakness and drowsiness. Contact a veterinarian immediately if symptoms are observed. This medication should not be used in animals that are allergic to it. Do not use in pregnant or nursing animals. Use with caution in animals with kidney or liver disease. Use caution when used with insulin or spironolactone. Consult your veterinarian for dosing and accompanying treatment, and for caution regarding drug interaction. Be prepared to monitor your pet regularly with blood tests. Lysodren follows a treatment regimen of a "loading phase" followed by a "maintenance phase" in order to help you manage your pet's illness. Do not handle Lysodren with your bare hands, particularly if you are pregnant or trying to get pregnant.